Introduced in 1961 to coincide with the release of the Walt Disney feature "101 DALMATIANS," this uncommon series of Disneykins was sold primarily in the United Kingdom, Europe and West Germany. Below are two versions of the original product lists; the first list was included with each boxed individual figure, and the larger second list appeared on the back of the "101 DALMATIANS PLANTATION" boxed set. For more information see the listing in the Disneykins Database. The list on the right was included with individual boxed figures. All the figures in the 101 DALMATIANS series are mostly uncommon. 35 puppies are indicated. Click on the list on right to see a larger version. The 101 DALMATIANS line is the largest series of Disneykins, with are over 47 figures; including 36 individual puppies; plus Pongo, Perdita, the Colonel, & Sgt. Tibbs, as well as the six "human" character figures (Cruella De Vil, Horace, Jasper, Roger, Anita, the Maid and the Preacher). From the back of the Marx "101 DALMATIANS PLANTATION" gift box set. There are 36 puppies indicated. Click on the list below to see a larger version. 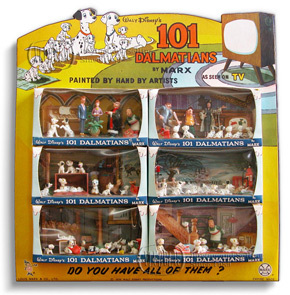 The Marx 101 DALMATIANS series was sold in the usual box formats: individual boxed figures, TV-Scenes (12), and larger scenic playsets (6). Also available were larger "gift" box sets. 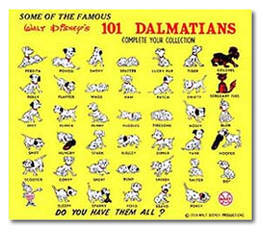 For more information, see the 101 DALMATIANS Section of the Disneykins Database. Commonly called a "Gift" box, this set includes (clockwise from top left) Colonel, Perdita, Pongo, Sgt. Tibbs, Patch, Hungry, Lucky Pup and Sleepy. Click on the photo on right to view a larger version. (from l. to r.) Horace, Cruella DeVil, the Maid, Jasper, the Preacher, Roger and Anita. The "human" figures were only sold in the larger playsets scene boxes and not available in individual boxes. The human figures are scarce in tiday's market. To view 101 DALMATIANS Playsets, see below. Click on the photo above to view a larger version. Shown below are three of the six 101 DALMATIANS playsets. Click to view a larger photo. This site averages over 6,000 unique users a month. If you have visited this site and found the content informative and entertaining please make a donation now. We really appreciate it!